Growing up listening to Go Go music, John teaches and practices his own “Beat Your Feet” dance moves to young people. Fusing dance with other types of knowledge to teach life skills – like geometry! In collaboration with Nicole Wisler. For Mike Peay, family isn’t just who you’re related to. They’re the people with whom you feel most comfortable. By Mike Peay, in collaboration with You-yuen Lee and Mike Sahl. Diagnosed with breast cancer at 27, Erin determined not to let cancer take anything from her and to use the experience when she was done. Devoting herself to working with others with cancer, her life took an unexpected turn, when her father was diagnosed with pancreatic cancer. In collaboration with with Elaina Kimes. The arts have always been a part of Saleem Hylton’s life. He talks about how music has carried him from a passion as a young boy, through a record deal with Motown, and into a career in youth development as an adult. by Saleem Hylton, in collaboration with Laura Triana Saenz. Toni Ford says that as a young girl, the stories she collected empowered her. By Toni Ford, in collaboration with Sarah Albanawi and Viviana Martinez-Gonzalez. Melani Douglass revisits a tragic incident in her past, which threatened to seize her ability to feel whole. Through her art, Douglass found the strength to become at peace with her life. by Melani Douglass, in collaboration with Akele Coffey and Olivia Robinson. Wanda Aikens reflects on the lessons and gifts she was given by her family as a young girl, and talks about why those lessons are important to pass down to her children. by Wanda Aikens, in collaboration with Emmett McGregor. Calling himself “an engineer who does art,” Uzikee has been creating public art in Washington for over forty years – art that challenges convention, insisting by example that his people “have something to say.” In collaboration with David Reische. Amber Robles-Gordon received some blunt criticism during her graduate studies when she was told she couldn’t seem to separate herself from her artwork. By Amber Robles-Gordon, in collaboration with Lena Shareef. Two boys' experience at the Sitar Arts Center in the Mt. Pleasant neighborhood. Organization: Sitar Arts Center | Filmmakers: Christina Cole, Adomas Lapinskas, Carolina Sandoval. Surrounded by art his entire life and now a musician, writer, actor, and painter, Jay is dedicated to teaching arts to children with autism and other special conditions. In collaboration with Anedra Edwards. When his wife of fifty years was diagnosed with cancer, Sam “knew how it was going to end.” He threw himself into writing a play about this “dance” with his wife. For the first time in this digital story, Susan talks about Sam and their cancer journey together, calling it “our” story. In collaboration with Allie Gardner, Geet Jeswani and Chantel Romero Hernandez. “I don’t hate cancer… even if it blew up the life I knew,” says Jacque. “…Because under all of the rubble of vulnerability, pain, loss, and uncertainty, I found the most beautiful little gems.” Faced with one medical crisis and then another, this remarkable young woman tells her story of continuing transformation. In collaboration with Samantha Adamson. Sheila Crider, co-founder of Free DC (The Writers’ Workshop), talks about her contributions to art history and literature by coining the term, “Blackstraction,” and its variants. by Sheila Crider, in collaboration with Rachel Lynne Smith. The love that Rev. Ivy Hylton’s great grandmother passed down to her provided the architecture for a fulfilling life. Through that love, Hylton acquired certain skills that continue to guide her every day. By Rev. Ivy Hilton in collaboration with Dana Reinert and Sarah Silvert. Roach Brown was sentenced to life for murder at twenty. In solitary confinement, he discovered his inner voice that called him to write a play for, about and performed by prisoners. Roach has carried his message of non-violence to prisons and schools across the country. In collaboration with Kelsey Hasmonek. Moving from one war zone (Nicaragua) to another (14th and Park Road in the 1980’s,) Luis first used his talent as a street artist to reflect the battles for turf around him. Now, he creates messages of love and beauty so that young people are not overwhelmed by their still-harsh surroundings. In collaboration with Efrain Ramirez. Bruce McNeil attributes his affinity for Fort Dupont Park to his former residency in Montreal. For McNeil, his world travels have influenced how he sees his neighborhood in Ward Seven, east of the Anacostia River. By Bruce McNeil, in collaboration with Lysette Urus. An exploration of Charles “Coco” Bayron’s work, as he grew from a graffiti artist in the Bronx to a tattoo artist, who eventually transplanted to D.C. By Charles “Coco” Bayron, in collaboration with Liz Calka. The Anacostia Rollers & Friends is a roller skating group made up of seniors who have been performing for the Anacostia community and beyond for over twenty years to improve community relations while showing their stuff. Produced by Peggy Fleming and Mike Sahl. 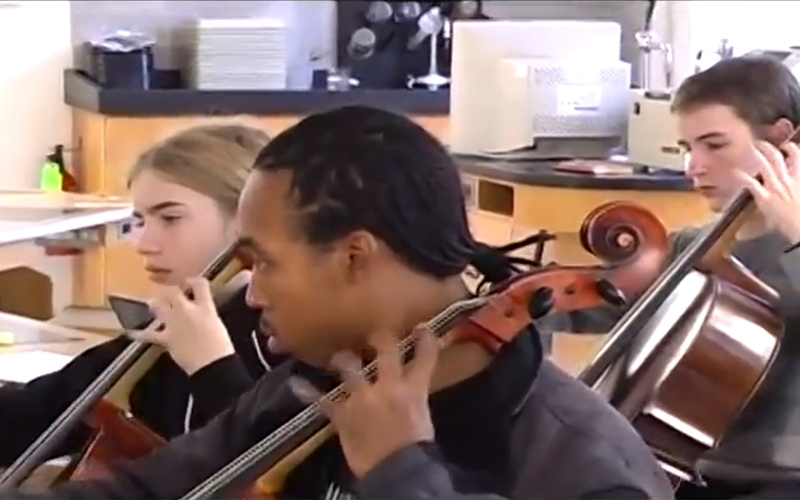 "The DC Youth Orchestra Program accepts all students and provides them with music classes and ensemble training for those who wish to participate." Produced by Kimberly Byden, Shayna Cohen, and Ted Samuel. Kristen turned from her work as a successful book designer, to create a color transformation project, using art to heal anyone in need of help – from young children to community elders. In collaboration with Natalie Hill. Throughout public school, Tendani escaped the world of guns, drugs and girls by absorbing himself in building things. Today as a multi-media artist, musician and teacher, he uses all that he has to build his community. In collaboration with Jacqui Langer and Matt Sutton. Questioning everything since she was a child, Jennifer uses photography to shake and wake people to think for themselves. In collaboration with Sara Gama. A choreographer and minister, Pastor Void uses music and dance to spread the gospel and help people express themselves, teaching people -- especially women -- life skills, and confidence. In collaboration with Alisa Morse & Jenny Harper. “How much suffering is enough?" asks Ben Hartman, a 33-year-old doctor who contracted cancer at the age of 28. The question runs deep for Ben who grew up in a family where members had perished in the Holocaust. In collaboration with Lizzy Lees.